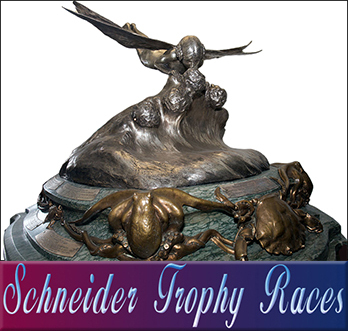 This Schneider Trophy website was created by Bob and Katie Martin in 2008 and was made for everyone that shares their interest in early aviation, and more specifically the 12 events that advanced aviation from under 50 mph to over 400 mph. Winning any of these 12 events gave bragging rights to nations, made heroes of their pilots and thrills to millions and also played a major role in the outcome of World War II. These were the SCHNEIDER TROPHY RACES. Bob and Katie’s passion for radio controlled flight, their interest in these races, and the desire to share both with others lead to the creation of an RC event that is still revered as one of, if not the most prestigious RC events ever. Giant scale RC aircraft worth thousands of dollars were modeled after the aircraft that were designed for the original races that took place between 1913 and 1931 in Monaco, Great Britain, Italy, and the United States. These events ran yearly from 1989 to 1992 and were sponsored by the Desert Hawks RC Club and the city of Lake Havasu City, AZ. They were covered by many major RC publications, the AMA and Forbe’s Magazine (Forbes Magazine Reprint). These were the SCHNEIDER CUP RE-ENACTMENTS. The catalyst for the Giant Scale Schneider Cup RC Re-Enactments is still a yearly event sponsored by the Desert Hawks RC Club. In its 33rd year, this years event will be held Nov. 9th 10th and 11th in Lake Havasu State Park at Windsor Beach 4, Lake Havasu City, AZ. This event is considered by many RC enthusiasts to be the best seaplane event of the year. This is the LONDON BRIDGE SEAPLANE CLASSIC. We continue to search the internet to find relevant information and sites that will enable the reader to easily locate information about these great events, both the original events and those created in various scales to replicate history and these incredible aircraft. If anyone has any information or sites we have left out, please contact the site administrator so we can continue to build the best source site for the Schneider Trophy information and events. The Schneider Cup Association is currently planning for the 30yr. reunion of the first Schneider Cup Giant Scale RC Re-enactment which will be part of the 2019 London Bridge Seaplane Classic and we need your help. If you or someone you know participated in any of the 4 Schneider Cup Re-enactment events please let us know. Additionally, if you know the whereabouts or the fate of any of the giant scale aircraft that were built to fly in any of these events please contact the site administrator. Anyone with an interest in these events is invited to attend the upcoming reunion. For more information about the reunion as it becomes available, we invite you to subscribe to our Schneider Cup Newsletter. If you’ve never heard about these events and would like to learn more about them please watch the following video. 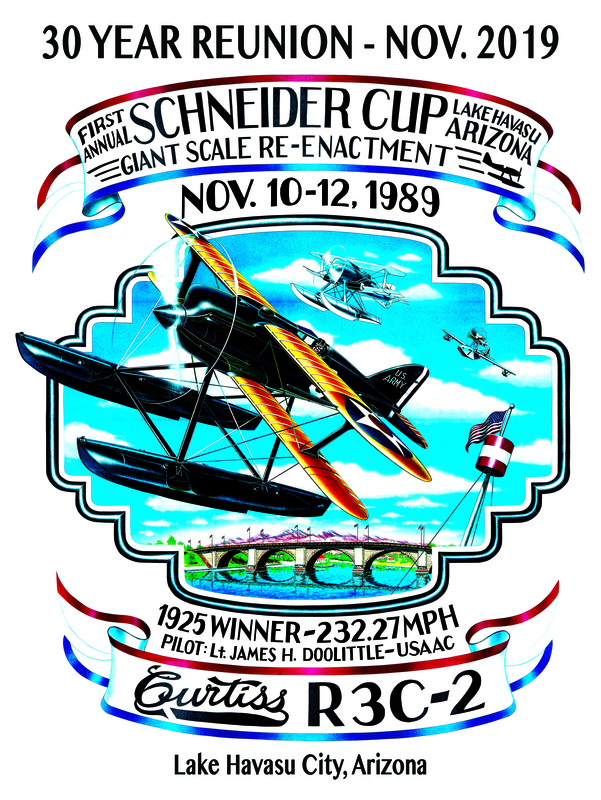 This video does an excellent job of explaining the full-size events which took place from 1913 to 1931 then fast forwards to the first Schneider Cup Re-enactment which took place on November 10-12-1989 in Lake Havasu City, AZ. 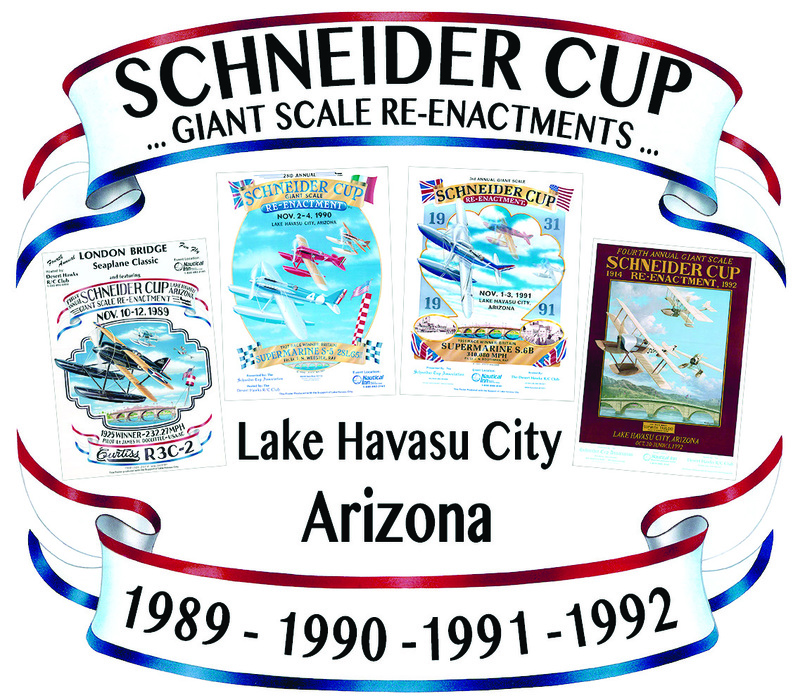 Below is a very good video that explains the original Schneider Trophy Races then takes you to the first Schneider Cup Giant Scale RC Reenactment which was presented by the Schneider Cup Association and hosted by the Desert Hawks RC Club of Lake Havasu City, Arizona in 1989. We hope you enjoy watching it as much as we do.